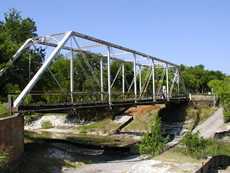 The Endangered Spring Creek Bridge of Ellis County, Texas. Another Piece of Texas to be Replaced by "Progress"
On your web page Waxahachie Images, you have a lovely photo of an old iron bridge. The photo is captioned: Historic bridge near downtown Waxahachie. I thought it might interest you and your readers to know that this bridge has a sister. 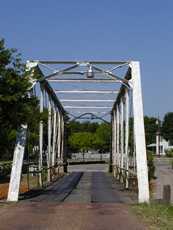 The bridge in the photograph was built by the Iron Bridge Company of Canton Ohio. That same company built a second bridge in Ellis County to span Chambers Creek. This second bridge was completed in 1888 and the note was paid off in 1890. The good news was that the bridge was sold by the County to a developer who relocated the bridge to its current location in Ellis County: 1890 crossing, spanning the Spring Creek, where it is daily used and deeply loved by residents of Ellis County. The bad news was that by moving the bridge, the bridge lost it's official "Historic" status. This is important, because the bridge is once again under threat. Residents of the Spring Creek area were surprised to see construction crews putting up "bridge out" signs. When they inquired more, only then were they told that the bridge was about to be demolished in order to make way for a new, modern, 2 lane concrete bridge. While TxDoT has a procedure for such projects, that includes at least 2 public outreach sessions to gage the feelings of the community, that process was not followed. Given the short amount of time, the citizens had no other recourse but to file an injunction against the county to stop construction. In doing so, they also invited the county to sit down with them and discuss other options for saving the bridge. After hearing the requests of their constituents, the county commissioner decided that an appropriate response would be to authorize filing suit against the citizens who are trying to save the bridge. Please help get the word out. To anyone who loves these historic reminders of our past, we need your help. Please contact the Ellis county commissioners and let them know that this bridge is loved, and needs to remain in its current location. Please call or e-mail them and ask them to save the Spring Creek Bridge. In particular, we want letters and phone calls to go to our commissioners, TxDoT, and our federal representatives (80% of the money being used for this project is federal money). There is a very short time frame to do something. We are being forced to drop our lawsuit due to the financial pressure being put on us by TxDoT so time is definitely running out.